What's Your Dream Video Game Holiday Gift? 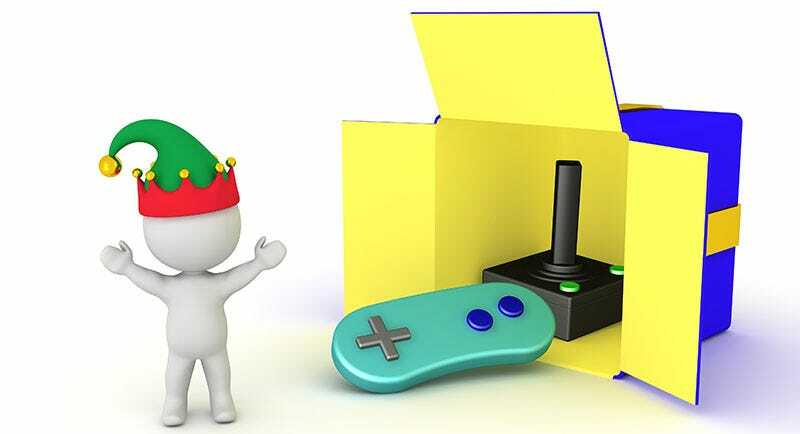 If you could get any piece of video game hardware, software or paraphernalia as a holiday gift, what would it be? Aside from a stock graphic of generic controllers coming out of a box. We’ve got you covered on that one. Every year my mother hounds me relentlessly for ideas on what to get me for Christmas aside from a LEGO Shop gift certificate (because my backlog isn’t big enough as it is). I’ll generally wind up asking for something practical—something I would have bought for myself anyway but just hadn’t gotten around to it. It’s not that I don’t have ideas. I have plenty of ideas. It’s just that the things I want are either ungainly, impractical and expensive (stupid Gauntlet arcade machine) or nearly impossible to find. Perhaps a little of both. Plus, making my mother shop for video game things is like my wife sending me to Walmart to pick up a pack of underwear—it’s embarrassing, stressful and she’d probably wind up getting the wrong thing. This is a Dreamcast that combines three of my favorite things in one game console—the color pink, translucent plastic and random cat-based iconography. Why was there a clear Hello Kitty Dreamcast? Why did they make a special keyboard for it? And check out that glorious pinkness, the special pale, sickly pink that Japan seemed to love in the late 90s, early 00s. It’s not that expensive—there’s one on eBay right now for $300. They pop up rather often, really. It’s just that they fall just above the amount of money I would spend for something I already technically have two of—Dreamcasts. I want one of these. I yearn for one. I will never buy one myself. I shared mine, now you share yours. What real, obtainable piece of video game goodness would you like to see wrapped in pretty paper and handed to you for relatively free? Tell us in the comments, and then leave your comment open on your computer where your friends and family can see it, just in case.